I bought a running shoe online. 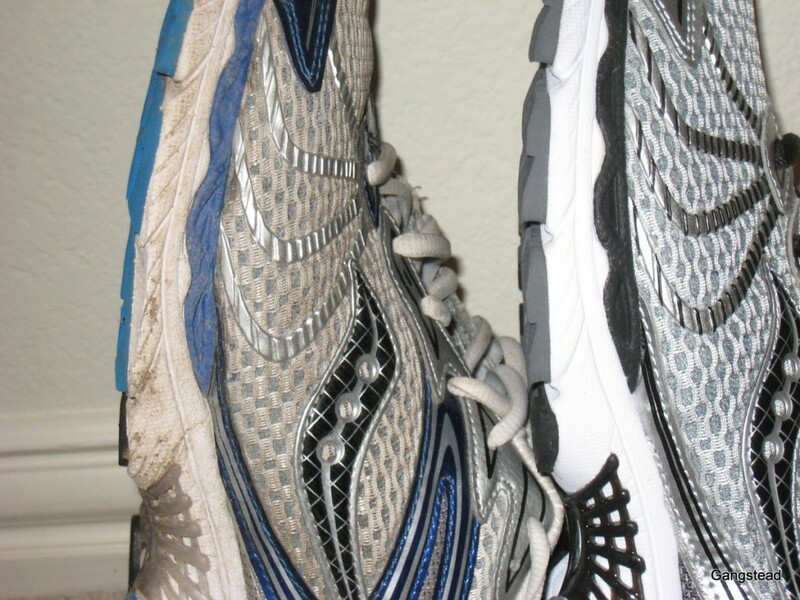 I usually go to the special running shoe store and go through the whole production of having them look at how my old shoe was worn and trying on a bunch of different ones and jogging around the store. I’ve been pretty busy lately and I was happy with my current shoe, Saucony Progrid Ride 3, but they change models every year. So I figured if I could just get the exact same shoe I’d be happy. Also I have a marathon one month away and now’s not the time to start a shoe experiment. I’m not usually able to do this because if you get one running shoe every year there’s different models. 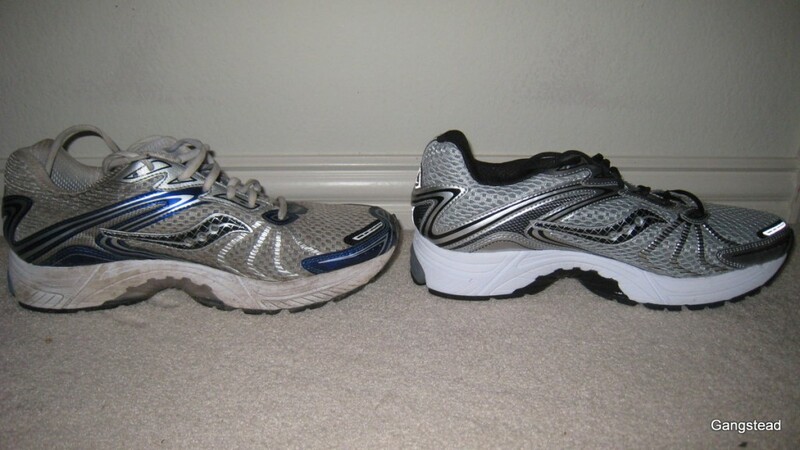 I went online and found the exact same shoe and size. I’ve never had an exact replacement so it was interesting to put them side by side and examine the wear. I use a Garmin and SportTracks to track mileage so the old shoe had exactly 287 miles on it (I only wear them for running). In my experience I start to have random pains after 300 miles on a shoe. I’m sure a lighter runner doesn’t wear out shoes as fast, but I think 185 pounds is more than average. I put one new one and one old one and jogged around the room a little and on the old shoe it felt like my foot was sinking in quick sand because the cushion had lost so much firmness. After reading Born To Run and following the barefoot running fad I changed from a heal strike to a mid foot strike running style. The heals show very little wear, you can still read the “XT 900”, whatever that means, on the heals. Up in the midfootular region I’d worn through the tread and the outside by the base of the pinky toe was running on foam. Also the toe was getting pretty bald from kicking off. 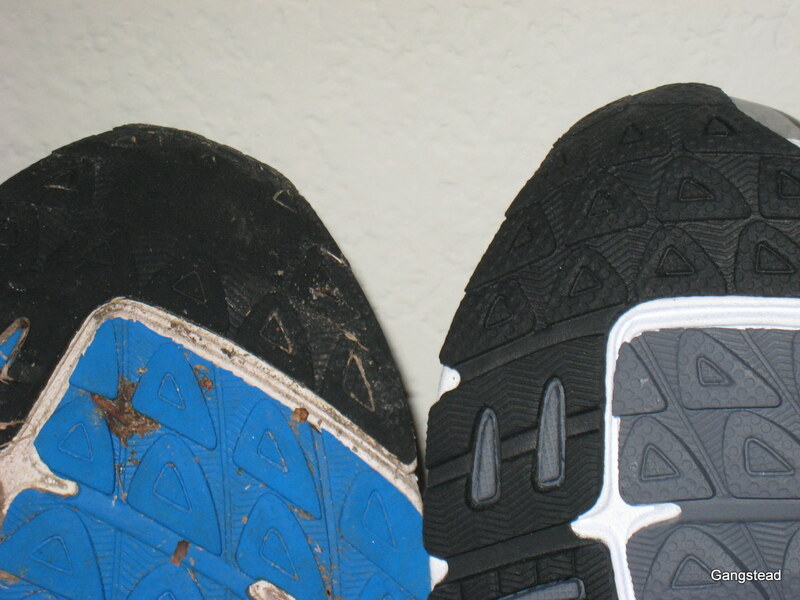 I knew the shoes were getting old, but having a brand new one to compare showed me just how much the tread had worn down. Pretty interesting. Interesting fact: The company’s first factory was founded in 1898 at Kutztown, PA, on the high banks of Saucony Creek.